Japanese were taught that dying for their country was a great honor. "Bear in mind that duty is weightier than a mountain, while death is lighter than a feather," read a piece of propaganda attributed to the Japanese Emperor. Japanese soldiers who believed they were going to die washed themselves and splashed on perfume like their samurai ancestors. During the war, some Japanese have said, generals and admirals believed their own propaganda about Japan being a sacred country that could defeat its foes with spiritual purity alone, and thus allowed themselves to fall behind the United States in developing technology and building up their forces. “We were brainwashed during the war, “ one man told the New York Times. The Japanese tokko campaign was incorporated as a military policy in July 1944 as a means to “destroy enemy aircraft carriers and transport ships at any cost. The strategy became a policy when the Tokko Department was established in September 1944. The first Kamikaze Special Attack For consisted of four units. In October, a 13-man attack force crash dove explosive-laden planes against enemy positions in the Philippines. About 700 pilots died in operation in the Philippines which continued until January 1945. The attacks had little impact on the fighting there. Kamikaze attacks became a tactic in the sea battle for Okinawa. A handful of kamikaze pilots hit their targets, but the vast majority fell harmlessly into the sea. They caused relatively little damage; their most profound effect was psychological. A total of 9,500 people died, including 3,535 Japanese, 34 warships were sunk and 185 were damaged in kamikaze attacks. In addition to this tens of thousands of Japanese soldiers and civilians died in the name of gyokusai, which literally means “jewel smashing” but came to mean “dying an honorable death” either by uselessly throwing their lives away in futile attacks or committing suicide rather than being captured. Kamikaze suicide attacks sunk 34 ships between October 1944 and the end of the war, and played a part in a the U.S. Navy's worst single day loss, at Okinawa. Named after a divine wind and "nature god" that saved Japan from a Mongol attack in the 13th century, kamikaze planes were usually ordinary service aircraft, loaded with bombs and extra fuel tanks that would explode on impact. They were the equivalent of human-powered cruise missiles, an idea not so different than the one behind the September 11, 2001 terrorist attack on the World Trade Center in New York. Kamikaze pilots operated manned-flying bombs ( Oka) and human-powered torpedoes ( Kaiten) in addition to explosives-laden aircraft. The idea of the suicide attacks was a last ditch measure by the Japanese to inflict as much damage and carnage as possible to break the will of the Allied forces. The suicide bombers were part of a mission called Ten Go (Operation Heaven). Most kamikaze aircraft were aimed at ships, some where also aimed at American B-29 bombers. Film: The Winds of God: Kamikaze is a film about a couple of comedians who die in a bicycle accident and are reincarnated as kamikaze pilots. Okha Kamikaze glider Takijiro Onishi, the vice admiral who founded the kamikaze force, suggested that 20 million people might have to die to secure a Japanese victory. In additional to kamikaze aircraft, his staff also drew up plans for manned flying bombs, human torpedoes, and suicide boats. Most of the kamikaze flights to Okinawa, Iwo Jima and other places near Japan took off from Chirancho in southern Kyushu, where there was also a training camp for kamikaze pilots. Most of the planes only carried enough fuel in their engine tanks for a one-way flight. The planes tended to be old and poor condition. One pilot wrote in his final letter, "I only hope I will be able to set off on my mission in a plane in good repair." 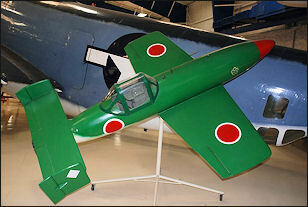 The ohka ("cherry blossom plane") was a glider that was released from the wing of a bomber near an enemy ship. Launched with three minutes of fuel, it contained a 2,600-pound bomb in its nose. The pilot who tried to slam the crafts into and enemy ship. The pilots of the ohka were called the Dive Thunderbolt Corps. Once deployed, the pilot had no means of escape. Forty-eight-foot-long kai-ten ("return to heaven") human-powered torpedoes could travel 48 miles at a speed of 10 knots. Packed with explosives, the nine-ton crafts were dropped from a mother ship and steered underwater towards an American ship by a pilot who used a periscope to see where he was going. At Okinawa, “I especially remember the "turkey shoot" one afternoon when 69 Jap Kamikazes flew into the harbor where or fleet was anchored. We exhausted our ammunition firing our guns at them. Their targets were larger ships such as battleships, aircraft carriers, cruisers and destroyers and they succeeded in inflicting major damage to our fleet. A shell probably fired by one of our destroyers exploded on our gun deck with shrapnel hitting our ready boxes, ventilator and wounding five crew members who were temporarily evacuated to a hospital ship for treatment. Nationalism is a remote concept for Japanese children today. The flag and national anthem remain controversial symbols of war-time militarism in some sectors. The government encourages public schools to raise the flag and sing the anthem, but my son’s private school never mandates those acts. My son cannot recite the lyrics to the anthem even though it happens to be one of the shortest in the world, with only 11 measures. An avid reader, my son immersed himself in books filled with letters, wills and diaries of the soldiers. My mother became worried that her grandson was getting brainwashed after she heard him say in an admiring tone, “They did it for the emperor.” She pointed out that the officers were men not that much older than him...At the Kaiten Memorial Museum on a small island off the coast of Western Japan’s Yamaguchi Prefecture, stone tablets bearing the names of the dead dot what was once the parade ground of the country’s largest kaiten base. My son skipped around the tiny monuments, calling out the names he recognized.